In this book the author explores the various meanings assigned to goods sold retail from 1550 to 1820 and how their labels were understood. The first half of the book focuses on these labels and on mercantile language more broadly; how it was used in trade and how lexicographers and others approached what, for them, were new vocabularies. In the second half, the author turns to the goods themselves, and their relationships with terms such as ’luxury’, ’choice’ and ’love’; terms that were used as descriptors in marketing goods. The language of objects is a subject of ongoing interest and the study of consumables opens up new ways of looking at the everyday language of the early modern period as well as the experiences of trade and consumption for both merchant and consumer. 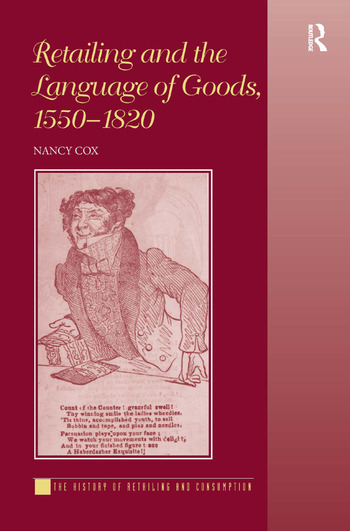 Nancy Cox is an Honorary Research Fellow and Academic Editor of the Dictionary Project at the University of Wolverhampton, UK. Previous books for Ashgate include The Complete Tradesman: A Study of Retailing, 1550-1820 and, with Karin Dannehl, Perceptions of Retailing in Early Modern England.